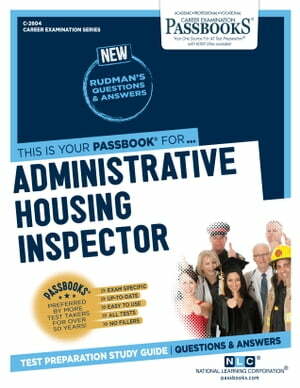 Collins Booksellers - Administrative Housing Inspector by National Learning Corporation, 9780829326048. Buy this book online. The Administrative Housing Inspector Passbook® prepares you for your test by allowing you to take practice exams in the subjects you need to study. It provides hundreds of questions and answers in the areas that will likely be covered on your upcoming exam, including but not limited to: management techniques; agency inspection procedures, rules and regulations and policy; assessment of condition of premises in order to determine the extent to which requirements are met; preparation of reports and correspondence; standards of proper employee ethical conduct; and more.